The line between Kobe and Kyoto was the first railway in central Japan. Further railway building took place from 1877 to 1884 – the short (11.25 mile) line to Otsu was designed and built by indigenous staff; the line from Tsuruga to Shiotsu; Nagahama to Shunjo; and East to the Nobi Plain. 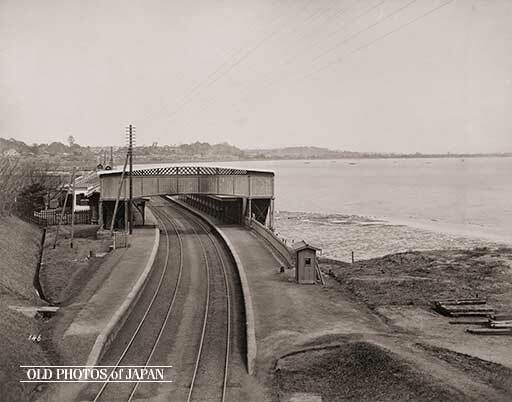 This is Shinagawa Station in the late nineteenth century did actually look this rural, with the waves of Tokyo Bay reaching to the very edge of the station. In those days, certainly nobody foresaw that the tiny country station would grow into today’s massive complex. It now services over three quarters of a million passengers daily, making it one of the busiest stations in Japan. In spite of its humble location and looks, Shinagawa Station played a title role in the development of Japan’s railway system. The country’s very first daily train services, which started on 12th June 1872, ran between this station and Yokohama. Yokohama’s foreign settlement had turned into a crucial trading port and was located some twenty kilometers southwest of Shinagawa. By the end of the Sino-Japanese War, railways “were ever increasingly becoming an integral part of the lifeblood and social fabric of the nation and as the network expanded, the effects began to be felt throughout the realm,” , (p187). As the century turned the San’yo Railway Company became increasingly self-confident. 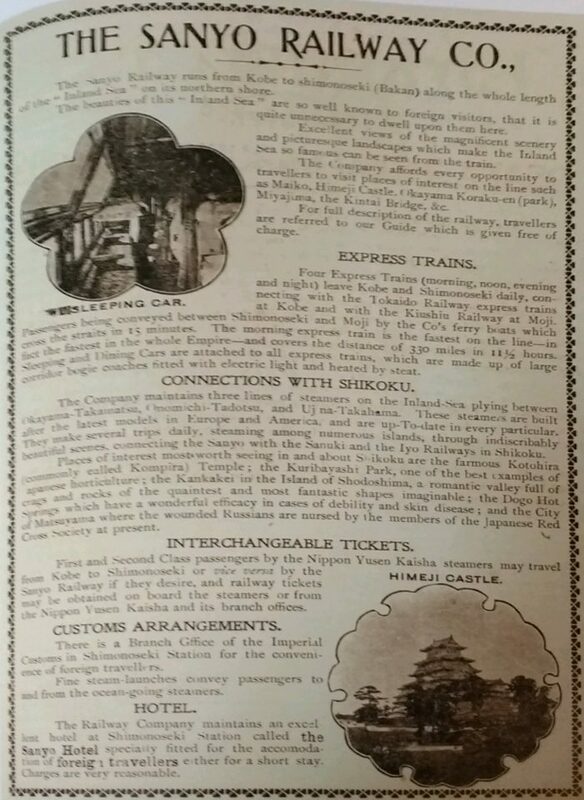 They were not afraid to bid for foreign tourist trade: “When this as first appeared in 1904, during the Russo-Japanese War, the progressive line had put in place three steamer routes connecting with Shikoku and a ferry route to Kyushu. It could also state that all its express trains (four in number) were electric-lit, steam heated, and furnished with sleeping and dining cars,” , (p197). Japanese railways: How does the UK rail network compare?